There are many interesting legends from around the world and through the ages that refer to mythical beings that are similar to horses. The Scottish Kelpies are some of the more intriguing of these creatures and tales about these water horses have been told far and wide around that country. In Scotland, the kelpie is a shape-shifting water spirit which resides in lakes and pools. The historian Douglas Harper defined kelpies as demons appearing specifically in the shape of horses. However, some legends say that it can also assume human form. While appearing as a human, the kelpie will still have its hooves. For this reason, the kelpie is seen as a malefic entity. In Scotland, almost every lake has a story about a kelpie. Probably the most well-known of these stories is the one about the kelpie of Loch Ness. In the past, human sacrifices were made to appease the gods and spirits of the waters. In time, this practice led to the appearance of the belief in evil water horses. There are some stories, however, in which kelpies are seen in a more positive light and are said to protect small children from drowning in lakes. Kelpies also apparently warned young women to be wary of handsome strangers. Kelpies are the most common water spirits in Scottish folklore and they can live both in water as well as on land. They often appear in legends as strong and beautiful black horses which live in the deep pools of rivers and streams in Scotland. Kelpies are known for preying on the humans they encounter. The hooves of the kelpie are thought to be reversed to those of a regular horse. In Aberdeenshire, the kelpie allegedly has a mane of serpents, while the kelpie of River Spey was known to be white and capable of singing. 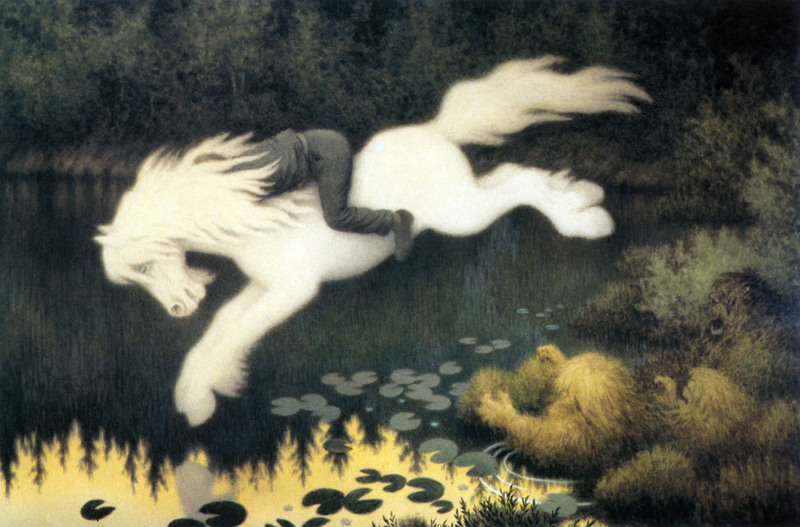 Nøkken som hvit hest (‘ The Neck as a brook horse’) (1909) by Theodor Kittelsen. ( Public Domain ) A depiction of the water spirit Neck, in the shape of a water horse. The tangie or tongie is another shape-shifting spirit from Orkney and the Shetland Isles. It is a sea spirit appearing in the form of a horse or as a merman. This spirit can also appear as an old man. The creature is said to be covered with seaweed and it allegedly loves to terrorize lonely travelers. Specifically, the tangie has a predilection for young women, whom it will abduct and devour under water. Black Eric, a sheep rustler, was known in legends for riding a tangie. The tangie he rode offered him supernatural assistance while raiding surrounding crofts. Ultimately, Black Eric fell to his death in the sea - but his tangie continued to terrorize the area. 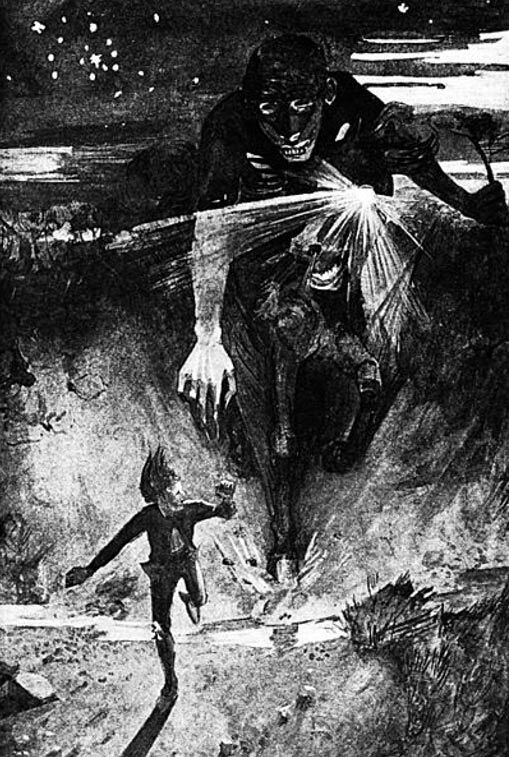 The nuckelavee chasing an islander, painting by James Torrance. 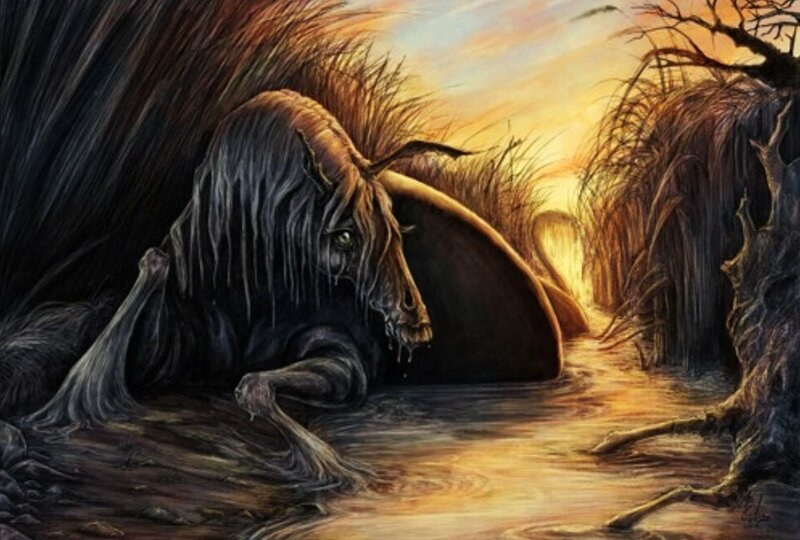 ( Public Domain ) A nuckelavee was another vicious entity that was a composite of a water horse from Celtic mythology and a creature imported by the Norsemen. The each-uisge of Scotland is known as “Ech-Ushkya” or as the “each-uisce” in Ireland. Literally meaning “water horse” it is a water spirit resembling the kelpie, but is far more vicious. Folklorist Katharine Briggs described the mythical being as “perhaps the fiercest and most dangerous of all the water-horses”. While the kelpie inhabits rivers and streams, the each-uisge lives in the sea and in lakes. It is a shape shifter disguised as a beautiful horse, a pony, a giant bird or as a handsome man. While it is in its horse form, should a person mount it, then the individual is only safe while the each-uisge is on land. However, as soon as the horse smells water it is the end for the rider. The horse’s skin will become adhesive and the horse creature will immediately take its rider into the deepest part of the lake, drowning him. Once the victim has drowned, the each-uisge rips the corpse apart and devours it, leaving only the liver to float to the surface. 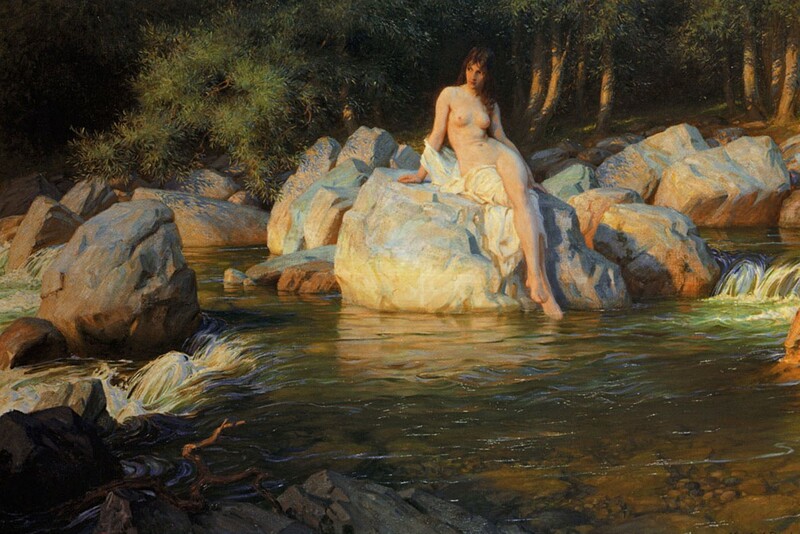 For this reason, people in the Highlands were often wary of lone animals and strangers they encountered near the water’s edge. ‘Boy on white horse’ (c. 1890-1909) by Theodor Kittelsen. ( Public Domain ) This image shows a boy riding a water spirit nykk (neck) in the form of a horse while it leaps into the water. On the Isle of Lewis, Croc-na-Beist, meaning “hillock of the monster”, is a knoll where an each-uisge was said to have been slain by the brother of a woman it tried to seduce while in its human form. A blacksmith from Raasay lost his daughter to the each-uisge. In revenge the blacksmith and his son made a set of large hooks, in a forge they set up by the loch side. They then roasted a sheep and heated the hooks until they were red hot. At last a great mist appeared from the water and the each-uisge rose from the depths and seized the sheep. The blacksmith and his son rammed the red-hot hooks into its flesh and after a short struggle dispatched it. In the morning there was nothing left of the creature apart from a jelly like substance . 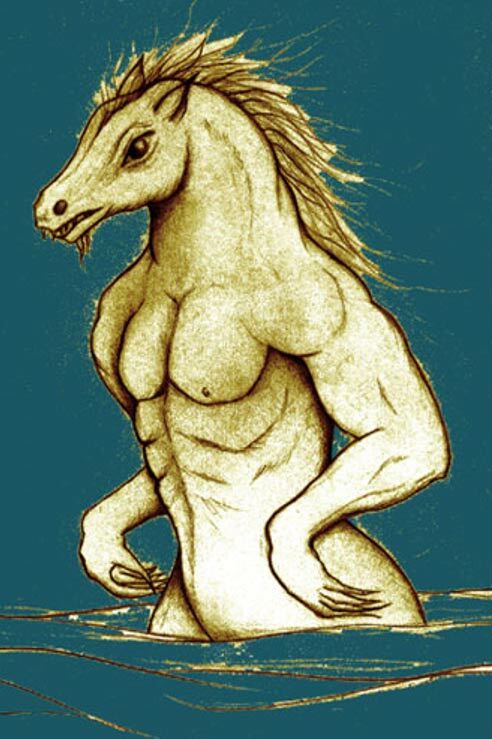 The hippocampus, meaning “horse monster” in Greek, is a mythical creature in Greek and Phoenician mythology. In English, the creature is often called a “sea-horse”. The being was also adopted by Etruscan mythology and it is described as having the upper body of a horse and the lower body of a fish. Melquart, the tutelary god of the Phoenician city of Tyre, was depicted as riding a winged hippocampus. Poseidon was also the god of horses and known as Poseidon Hippios. Even though it was not a water horse, Sleipnir of Norse mythology is also worth mentioning here. Sleipnir was the eight legged steed of the chief god Odin, the child of Loki, and the fastest horse in all of the nine worlds. As it can be seen, horses have been present in human history since the beginning of time and they have also entered the myths and legends of the world in a variety of forms.